Over five years ago I attended a one-day conference in Cardiff in Wales on Ancient Britons, Europe and Wales. At the conference Professor Sir Walter Bodmer presented the first results from the People of the British Isles (POBI) project which were hot off the press having only been analysed three weeks previously. The audience were completely blown away by the results. For the first time researchers had been able to detect regional differences between the people of Britain based on their DNA. Sir Walter shared a map with us and you could even see that some counties, such as Devon and Cornwall, stood out as distinct regions in their own right. I don't have a photograph of the map that we saw that day in Cardiff but it was probably very little changed from the map that appeared in the published paper in Nature in 2015 and which you can see here on the Wellcome Trust website. I remember thinking at the time that this research opened up the tantalising possibility of being able to receive an admixture report from a genetic ancestry company which would allow you to compare your results with the POBI data and see how much of your ancestry came from Devon or Cornwall and other regions of Britain. I am very pleased to report that that day has now arrived with the launch of a new DNA test from a company called Living DNA! 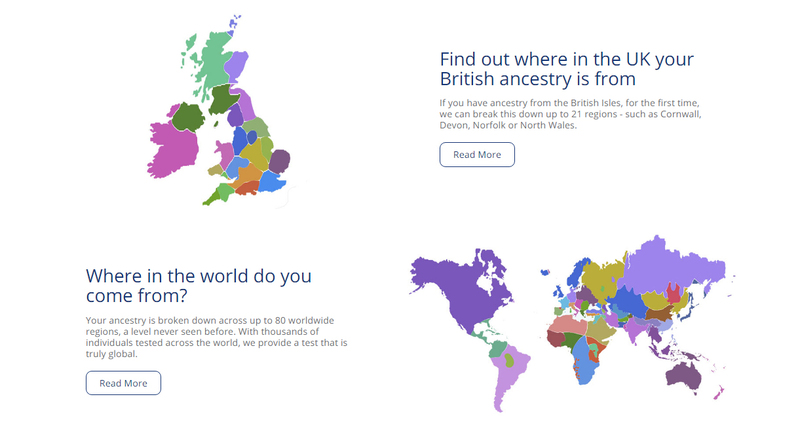 This is the first genetic ancestry test to incorporate data from the POBI Project and to give customers the percentages of DNA that they share with people from different regions in Britain. Disclosure. I should declare here that I have been involved in informal discussions with DNA Worldwide over the development of their product. I have not receive any payment but, in return for my advice, I will receive a free Living DNA account. The company have had access to my raw data files from AncestryDNA, 23andMe, Family Tree DNA for testing purposes. Yesterday I had a Skype briefing about the new test from David Nicholson of Living DNA. I also received a preview of my own results, though I don't yet have access to my online account. There is still some tweaking going on behind the scenes and the results I've received are likely to be changed, so I will report on my results once I have my account. The original POBI map, which formed the centrepiece of the Nature paper, featured 17 regions. For the new Living DNA test the POBI data has been re-analysed using improved methods and the data has been clustered into 21 areas across the British Isles. 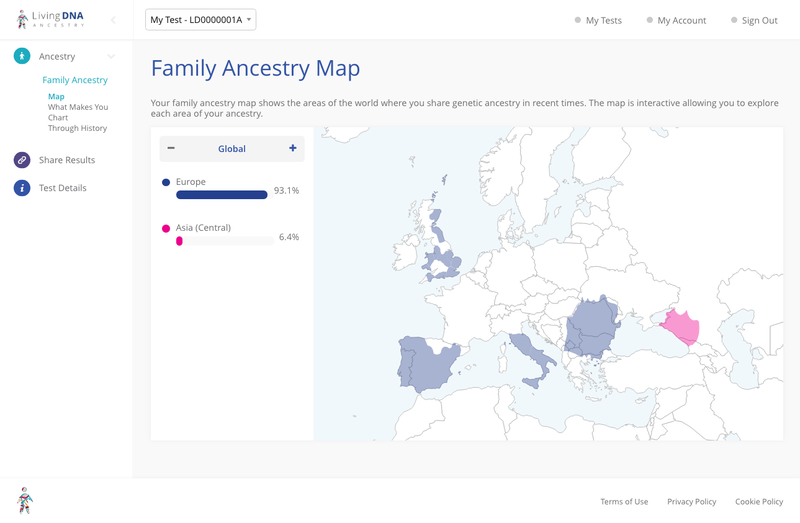 A unique feature of the test is the "back in time" map which allows you to see how your DNA matches with populations across a range of historical dates. Historical population statistics have been used for the mapping. All the existing tests on the market are trying to pick up on the small and very recent differences in our DNA but this means that the bigger picture of our universal relatedness gets lost. Recent studies have shown that you only have to go back about 5000 years or so before we reach a point where we all share the same ancestors. I hope that this new test will go some way towards educating people about our common ancestry and the knowledge that there is no such thing as "race". Here are some sample reports which have been provided by the company. The first map shows "the areas of the world where you share genetic ancestry in recent times" at the continental level. This second map provides regional resolution. On the regional map you can click through and see how your ancestry is broken down within the different regions. If you have ancestry from Britain you will be able to see your shared percentages of DNA in comparison with the local populations. The test has also been built so that people with mixed ancestry from other countries get more detail than ever before. 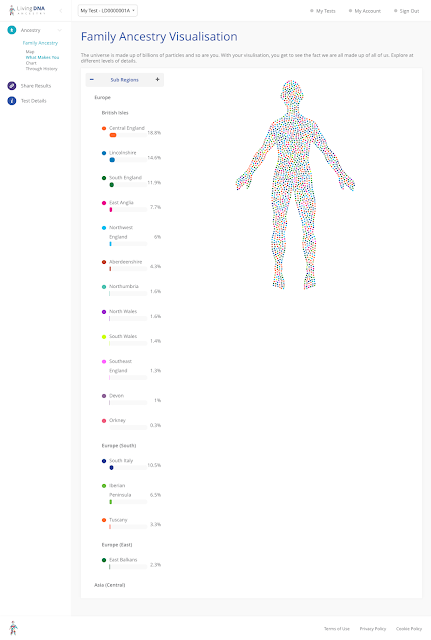 Here is the family ancestry visualisation. The Living DNA test is currently available as a new standalone test but they are also planning to accept imported data from other companies for a small fee. It is hoped that this feature will be available by the end of the year. I understand that GedMatch are preparing to accept uploads of raw data from Living DNA. I hope that Family Tree DNA will also be able to accept the raw data as this test is likely to attract a lot of interest and we want to ensure that people who are interested in using their results for genealogical matching are able to do so. The Living DNA test was offered to the public for the first time last weekend at the New Scientist Live show at the ExCeL arena in London. The test can be ordered from the website at www.livingdna.com and the kits will be shipped in mid-October. Living DNA is a collaboration of over 100 world-leading scientists, academic researchers and genetic experts. The team is led by DNA Worldwide Group, a DNA testing company, whose services are used by every court in the UK. The company is run by David Nicholson and Hannah Morden who saw an opportunity to show humanity that we are all made up of all of us, dissolving the concept of race. It was launched in 2016 after two years of intensive development but its parent company DNA Worldwide Group has been operating since 2004, and employs over 35 people from its head office in Somerset, UK. Although Living DNA is a for profit company they also intend to use their test for educational purposes to show how we are all connected to each other. They are working with an organisation called Show Racism the Red Card, a UK charity which works to combat racism. The company are working with a school in East London and ten schools around Europe. They also have PhD students working with them on different projects. The following video provides further information about the company and the philosophy behind the test. Who are Living DNA from Living DNA on Vimeo. The Y-DNA SNPs have been selected from the 1000 Genomes Project and research papers, and checked and reviewed on the ISOGG SNP tree, The Y-SNP test has been developed in collaboration with Professor Mark Jobling and Pille Hallast at the University of Leicester. The mtDNA SNPs have been selected by a team of scientists at Innsbruck University in Austria. They have used Phylotree and the latest tree builds to select the most useful mtDNA SNPs. The autosomal component of the test has been developed by Daniel Lawson, Grady Weinberg, Daniel Falush, Garrett Hellenthal and Simon Myers. Lawson, Falush, Hellenthal and Myers were the team who developed the fineSTRUCTURE program used for the analysis of the POBI data and they were all authors on the POBI paper. The Living DNA test uses a refined version of that program upscaled for commercial use. fineSTRUCTURE is a haplotype-based method which takes advantage of the fact that SNPs travel together, and provides a more detailed analysis. The autosomal DNA data is phased prior to processing. White papers will be published soon with more information. It will be possible to share results on the platform with friends and family and to manage multiple kits from a single account. The test is done using a mouth swab. There is no liquid involved. This method has been chosen to facilitate international shipping. The developers have worked hard to ensure that the new chip is backwards compatible with other chips so that data can be accepted from all companies. The intention is to make the transfer process as easy as possible, preferably by interfacing with company APIs where available. Customers will be able to download their raw data. Raw data will be imputable so that it is backwards compatible with older chips. The test is available worldwide but prices will vary from country to country depending on local taxes and shipping rates. Negotiating global shipping rates and regulations is an extremely complicated process and prices are subject to change. There will be no hidden extras and the cost of shipping (including return shipping) will be included in the advertised price. The website currently shows prices for the UK, USA, Canada, Australia and Europe, and a standardised international price for other countries. Participants will have the opportunity to opt into academic research studies. It is planned to add in more data as it becomes available. It is hoped in particular to get some samples from Ireland. Updated ancestry reports will be provided free of charge and there will be no subscription fees to receive the updates. There are plans to incorporate ancient DNA data. A chromosome browser view is in the pipeline. There is a long feature list in development, and the company hope to receive feedback from the community and will develop the tools that people want. There is a major focus on privacy. The customer decides what happens to their data. All the processing is done within the European Union. Data will not be sold on to pharmaceutical companies. Care has been taken to ensure that people understand the implications of testing. Children under the age of 18 can take the test but will be required to re-consent once they reach the age of 18. There will be an option to nominate a beneficiary. For full details read the company's page on Privacy and Security. This is a very exciting new test. It is a very pleasant change to have a test that specifically caters for the British and European market. The admixture tests currently provided by the big three genetic genealogy companies are primarily serving the very different needs of the American market. Access to the POBI dataset is what we've all been waiting for and I'm sure that everyone is going to be keen to see how their results compare. I'm also particularly pleased to see the back in time map which I hope will be a useful educational tool and will help to improve our understanding of our shared human ancestry. This is a very welcome addition to the genetic ancestry marketplace, and I look forward to seeing some interesting new developments in the future. - See Chris Paton's blog for the official press release. - For further commentary see John Reid's blog post More on the Living DNA genetic ancestry test and plans. - Razib Khan provides some insights on admixture in his blog post on Scale of time and space in admixture. So, it is anticipated that AutosomalDNA (from GEDMatch data) can be uploaded for a fee? Hi Gene, The idea is that they will eventually be able to accept raw data from any of the big three testing companies (23andMe, AncestryDNA and FTDNA). Hopefully you won't have too long to wait. Will this be available for non Bristish DNA testers ? Yes it's available worldwide. Click on the flag on the home page to change the country. I have been a participant in the POBI project providing DNA on two seperate occassions (as well as other tests) so I am very interested to see how my own results map out. Please also to see that potentially my autosomal results with FTDNA can be uploaded. Thanks for the heads up with this. It will be good for POBI participants to finally have a way of comparing their data with other participants. I would have thought they ought to offer you a discount on the test! The population in Scotland is a bit sparse in the mountainous interior anyway. We'll have to see what the results look like for Scottish people. I would hope that there are enough samples to pick up any Scottish ancestry. This is fascinating stuff! I will be looking forward to transferring my DNA from family tree DNA to living DNA for a small fee. I see in the results of POBI project concluded people native to the UK are descendants of a bunch of migrates. The results showed that the French and Germans contributed significant amount of DNA to people who are from the UK. The results also give us a detailed map of the breakdown of 17 distinct genetic clusters. I would like to know does living DNA give you the same breakdown of what contribution of what European genomes is in your DNA as well as what UK grouping you from? Liz, The test will include regional breakdowns within Europe but I don't know how detailed these breakdowns will be. There is in equivalent French or German dataset that compares to the POBI Project. Will your test track my father even if I am female? Annette, I'm not employed by the company and am only reviewing the test. The test includes autosomal DNA markers which are inherited from all your ancestors on both your maternal and paternal sides. If you are interested in researching your fatherline specifically for genealogical purposes then the best option is to get your father to take a Y-STR test with Family Tree DNA so that you can search for matches in their Y-DNA database. Interesting to see a part of Europe within the bounds of Europe under the control of Russia listed as Central Asia. Interesting as that region is where the majority of the ancestry of Northern Europeans come from including those living in Ireland and Britain. On raw data transfers from other companies like 23andme, customers who do upload raw data to LivingDNA would only be able to receive autosomal results, or would they be able to receive both autosomal and haplogroups? 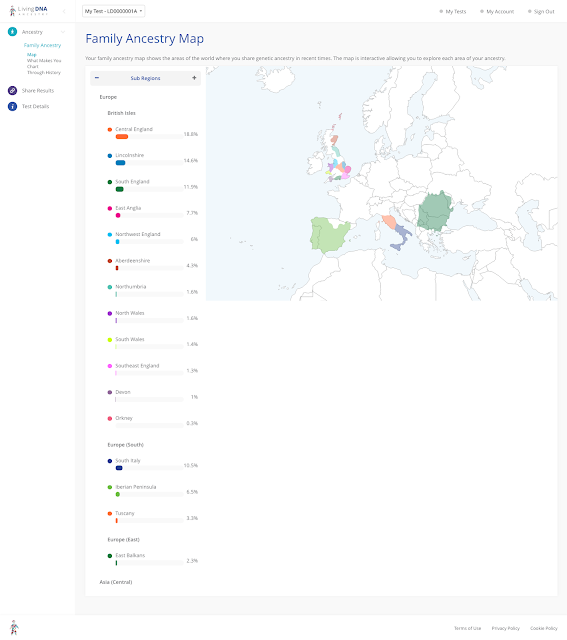 If it's 23andme raw data, and 23andme has haplogroups, I don't see why LivingDNA can't give both the autosomal and the haplogroups. The Living DNA test does include Y-DNA and mtDNA so in theory they should be able to provide haplogroups as well. However, their new chip will have many more Y-DNA and mtDNA SNPs than the current 23andMe chip so you would get much finer resolution with a new test. They are still working out the transfer system so it remains to be seen how that will work out. Would there be much British regional difference in ordering this new chip or uploading say 23andMe's old chip data, when the option becomes available? Solothum, Living DNA are doing some comparisons between my results from the new chip compared with my data from AncestryDNA (v1), FTDNA and 23andMe (v2). They apparently got the best results from my 23andMe data. The preliminary results I've seen indicate that the transfers won't pick up the minor trace percentages, and there are some differences in the percentages from different regions. I'll publish the full data once the analysis has been completed. If anybody has 'recent' Irish ancestry will this show, or will this happen at a later date? I've seen some results where people have received Irish percentages. The Irish ancestry reporting will improve when they get more samples from their Irish grandparents project. According to the ancestry.com DNA test I took, my heritage is 82% Great Britain and 10% Irish. Will this test give me more specific information on where in Great Britain and Ireland my ancestors came from? thanks for your help. The Living DNA test seems to work best for people of recent British ancestry. If you don't know where your ancestors were from in Britain then I don't think at present you would be able to use this test to inform your research. You're likely to get a mixture of small percentages from different UK regions. 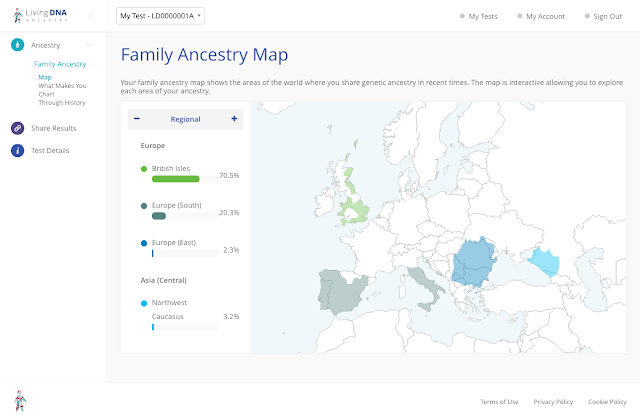 AncestryDNA will be rolling out their Communities feature soon and that will give good breakdowns in Ireland. Really very interesting and very valuable information about the DNA testing nice work.